In the eighteenth century it was almost impossible for the clockmaker to make springs for this clock. Therefore they usually had them made by specialized springmakers. The problem with spring driven mantle clocks was, that the springs tended to wear out and become ever weaker. Here the mantle clocks driven by weights had an advantage. With the appearance of the fusee gear this problem was solved. Never the less weight driven clocks remained the more reliable alternative, whereby the spring driven clocks had the disadvantage of being less durable and more sensitive to handling and dirt. That is main reason these clocks where mostly found in rich homes. The weight driven clock was more in use generally as it was by far not as expensive and was more durable. During the seventeenth century it tended to be the one and only clock in the house and its chiming could be heard in all the rooms. The table clock had a far quieter chime as usually was not the only clock in the house and it could be carried around. These spring driven clocks were also known as bracket clocks, this is because of the mounted bracket that some had, enabling the owner to hang the clock on a wall. The clocks were often found on tables on the mantel, later a beautifully decorated back plate was fashionable, this fashion ended with the end of the 18th century. This back plate would be seen when the clock stood in front of a mirror. Most of the first bracket clocks had a verge escapement with a short pendulum. The anchor escapement was first introduced in longcase clocks. The bracket clocks were still built with the verge escapements until the end of the 18th century. The verge had a lot of advantages but the main disadvantage was that it was very sensitive when it comes to level surfaces. Moving a clock with a anchor escapement, could make it stop. The problems were solved by the end of the 18th century. This made the verge escapement obsolete. The anchor escapement was considered to be far superior, this meant that many clockmakers changed verge escapement clocks into anchor escapement clocks. This to meet the increased demand for exact time pieces. 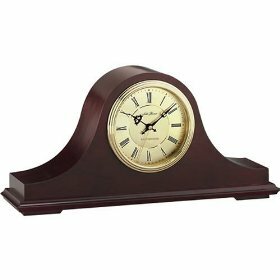 Nowadays an antique mantel clock collector will tend to look for mantle clocks with the original verge escapement, one that has not been converted to an anchor. Decorating your home with a Curio Grandfather Clock.